Drymarchon couperi has even blue-black dorsal and lateral scales, with some specimens having a reddish-orange to tan color on the throat, cheeks, and chin. Drymarchon couperi received its name from the glossy iridescent ventral scales which can be seen as blackish-purple in bright light. This smooth-scaled snake is considered to be the longest native snake species in the United States. 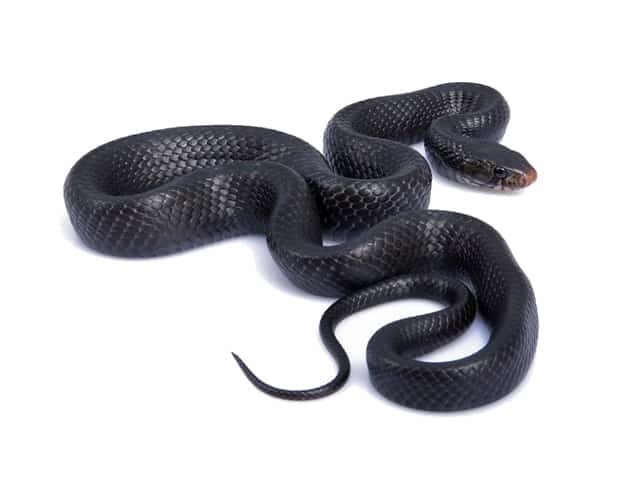 Indigo snakes are sexually dimorphic, with males growing to larger lengths than females. One of the primary reservations people have about keeping indigos is their defecations. Drymarchon are notorious for having fast metabolisms with frequent and foul-smelling defecations. Drymarchon breeders are constantly on the hunt for substrates that contain the odor and help to maintain a clean environment for the snakes. Chief concerns are: making certain the substrate is not large enough to cause impactions if ingested, odor control, and humidity retention. As with most reptiles, a thermal gradient is recommended for indigos. Allowing the snakes to thermoregulate themselves most accurately mimics their natural behavior in the wild; the trick is to provide the correct temperatures at both ends of the cage. Drymarchon are very sensitive to high temperatures, and novice keepers often accidentally kill snakes by mismanaging cage temps. Ambient temps in the snake room should be kept between 21-25 ºC (70-78 ºF) as the temps naturally fluctuate with the seasons. Temps on the cool side of the cage should never exceed 28ºC (82 ºF). Once a stable room temp is provided, a hot spot should be given on one side of the care that can be 29 ºC (85 ºF). Indigos drink relatively high volumes of water and the need to provide them with a steady supply of fresh, clean drinking water is much higher than it is for most other reptiles. As mentioned above, drymarchon are extremely sensitive to dehydration, and a lack of clean drinking water, even for a few days, can lead to serious health problems. Drymarchon need to have some amount of humidity in their cage. Some keepers provide this humidity by providing a substrate that holds moisture well like peat moss and misting it daily. Others, myself included, prefer to provide a humid hide box in the cage that is filled with slightly damp spaghum moss. The snakes will use this humid hide, particularly as they prepare to enter their shedding cycle. A properly hydrated snake will be much less likely to retain eye caps and tail tips while shedding. Humidity can also be raised with a wide, and shallow water dish. Most drymarchon live in areas that experience heavy seasonal fluctuations in humidity and rainfall. Many keepers mist their cages to mimic these seasonal changes. Proper caution should be taken to prevent oversaturating the substrate. As a general rule of thumb, the moisture from the misting should dry out over night to avoid the risk of mold or mildew growing in the cage. Indigos are generally very aggressive feeders. They are not constrictors and are adapted to crush and devour their prey in their extremely powerful jaws. Although many keepers successfully keep their drymarchon on a rodent-only diet, I am a firm believer that the snakes are happier and healthier with a varied diet. In the wild, these guys will eat just about anything they can overpower. Other snakes, lizards, birds, fish, frogs, rodents… anything is game! As such, I feed my snakes chicks, chicken necks, quail, fish, rats, mice, and other snakes. All are frozen thawed and are proportionally small. I keep the meal sizes small for a few reasons. First, their jaws do not open as wide as other snakes. Even an eight-foot indigo can’t handle a jumbo rat. Large meals can also cause some adults to lie around and get obese. I believe the animals do well with smaller, more frequent meals. I feed them small/medium-sized meals twice a week. The appetite of some adult drymarchon can fluctuate seasonally. Shorter days and cooler nights often cause my adults to lose their appetites for a period of time. This is perfectly normal. They should start eating more consistently when springtime rolls around. My snakes’ appetites are always in full swing during the warmer summer months. A keeper should always be extremely cautious when opening cages around feeding time. It is not uncommon for an indigo to lunge out of a cage with a gaping mouth. These are extremely powerful animals with jaws like vice grips. If bitten, expect severe lacerations and a lot of blood. Be on your toes and extremely cautious during feeding time! No matter what substrate you choose to use, the reality is that drymarchon keepers probably end up cleaning cages more often than most other keepers. If this is a bother for you, then perhaps and indigo is not the right choice for you. A clean cage is essential for any reptile’s overall health. I spot clean my cages 1-2 times a week, and I deep clean them once every month or so.